As modern technology continues to evolve it seems that people are sitting more and more. With smart phones and tablets such a big part of everyday life many of the activities that used to be physical are now played out without having to move much at all. It’s not uncommon for someone to get out of bed, sit in a car on the way to work, sit all day at a desk, sit in the car on the way home, and then sit all evening watching television or playing with their smart phone. Many visits to a Dickinson chiropractor deal with back pain and related back issues, and too much sitting is one of the main culprits. Next, make yourself get up and out of your chair at least once every 30 minutes. Take a walk around the office, do some light stretches or just stand, but make sure you get up. If you have access to a standing desk use it for a portion of each day. The key is to take short movement breaks everyday so your muscles, tendons, and ligaments stay loose and flexible. If you have a sore back from too much sitting a visit to your Dickinson chiropractor will help get things back in balance and remove your pain. 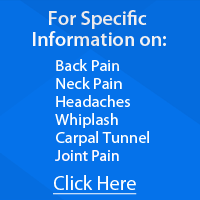 Contact our team at Neck & Back Pain Treatment Center today for help.